Gangster Squad has landed on DVD, Blu-Ray and digital download with an all-star cast in tow. 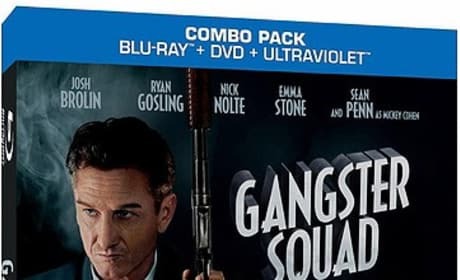 Ryan Gosling, Sean Penn, Josh Brolin and Emma Stone shine in the true story of gangsters taking over post-war Los Angeles. Gangster Squad finally hits theaters after a several month delay for re-shoots. Our Gangster Squad review can easily say that that break had nothing to do with film quality, the normal culprit. 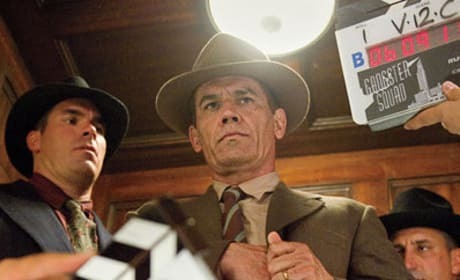 Gangster Squad: Josh Brolin Talks Fighting Sean Penn! 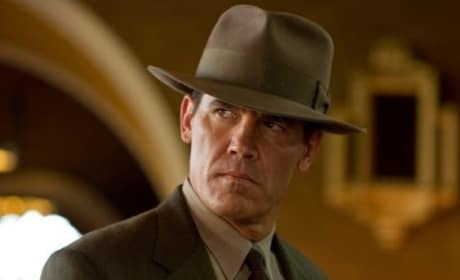 Josh Brolin headlines Gangster Squad and talks to Movie Fanatic about re-teaming with Sean Penn after Milk. Brolin also admits that the great cast -- including Ryan Gosling, Emma Stone and Michael Pena -- were not the studio's first choice! Gangster Squad Giveaway: Win Gangster Goods! As Gangster Squad lands in theaters, Movie Fanatic is proud to give away a slew of gangster loot. The film, based on a true story, stars Josh Brolin and Sean Penn and we've got a ton of Gangster Squad prizes! A new featurette for Gangster Squad has hit the net. The film stars Sean Penn, Ryan Gosling, and Josh Brolin. 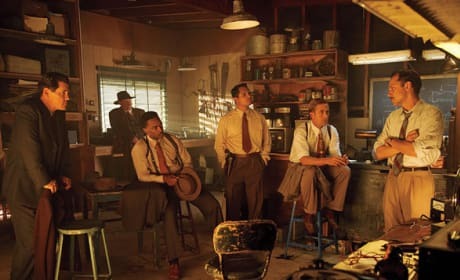 A ton of new stills have dropped for Gangster Squad. Josh Brolin, Ryan Gosling, and Sean Penn star in the crime thriller. Gangster Squad Character Posters: No Names. No Badges. No Mercy. 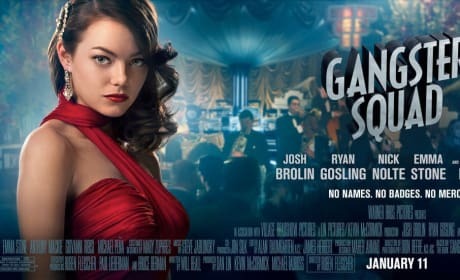 Eight new character posters from Gangster Squad have hit the net. The crime drama hits theaters January 11, 2013. There's a new trailer for Gangster Squad! 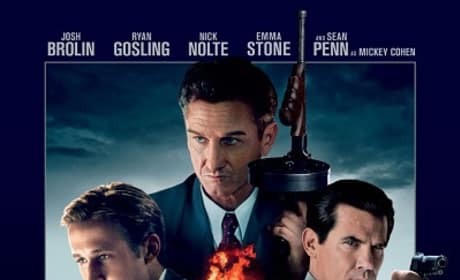 Sean Penn, Josh Brolin, Ryan Gosling, and Emma Stone star in the 1940s gangster film. 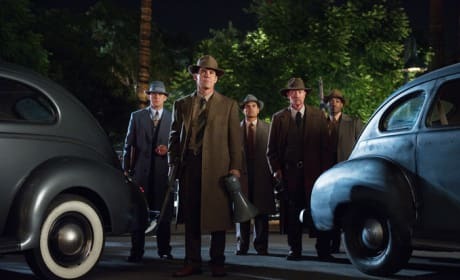 We've got some cool set photos from the upcoming crime drama Gangster Squad. The film stars Josh Brolin, Emma Stone, Ryan Gosling, and Sean Penn. 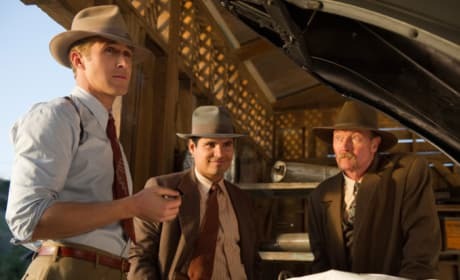 Josh Brolin and Ryan Gosling star as 1940's LA cops who stop at nothing to take down east coast mobster Mickey Cohen (Sean Penn), who takes control of the city.